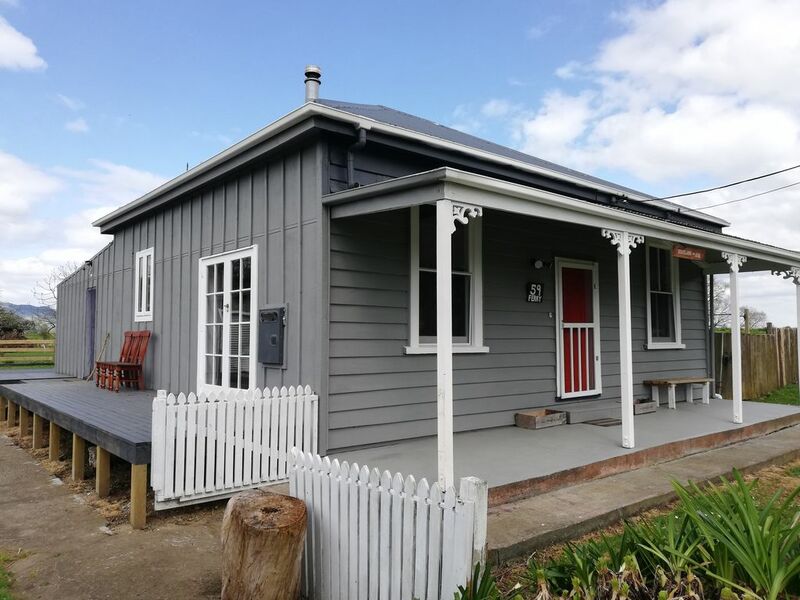 We are an old Railway Farm Cottage in Hikutaia on the Hauraki Grass Plains in the Thames Valley, next to the original railway and river that serviced the area now called the Hauraki rail trail. The cottage is in close proximity to Thames, Ngatea, Paeroa and the Coromandel. The entirety of the house is yours it has lots of room to relax, rejuvenate and find serenity, just kick back and enjoy having a break. You will need a car or bike to explore Hauraki Plains/Thames Valley is an area which is steeped in a rich colourful history of gold, gum, farming, dairy, maritime, logging, fishing and its bubbling spring mineral waters enjoyed by the Maori and Local Settlers. The Local Pub has great food and is a 5 minute stroll down the road. Our Cafe also at the end of the road, has all your necessities, they have really good Coffee and Ice cream. The serving sizes are real kiwi sizes so expect LARGE! The Cheese factory, Christmas tree farm, Pururi Coach house is a short drive away, along with the fresh spring water swimming holes. 10 - 20 mins drive from the house are Local Boutique Shops, Cafes, Butchers, Vintage Memorabilia, Markets, Museums, Festivals, Farm visits, Shopping, Rapaura water gardens, Wineries, Hunting, Golf courses, Fishing, Boating & Sports events. The beaches around us are at Waihi a 30 min drive or drive off in the opposite direction to find an array of beaches a 20-45 min drive away dotted along the Firth of Thames & Coromandel district. Hot water beach is an hour over the hill but remember to take a spade with you, after digging your very own spa pool you can sit in the hot spring water. In the afternoon we have amazing sunsets to photograph at the farm, or spend the afternoon soaking away in our outdoor bath. On a clear night we have no light pollution, so sit outside and enjoy the magnificent starry skies. Property fenced for stock so is not suitable for small children unless supervised by an adult, large drains, a river, water troughs, 67.5 cm decks. WE HAVE 24 HR EXTERIOR CCTV to protect our property and yours while you stay. Extras: Cleaning NZ$50.00 per stay. I am in my late 40s with Christian values, I love pottering around on the property & making things. I enjoy people & getting to know them, I treat people as friends. We have had overseas students for years & have loved sharing our beautiful country with them. But now it is time to share our cottage with others who want to explore & do activities around the area. This property is so peaceful & serene away from all the hustle & bustle of city living. Heading to the country is like stepping back in time. A time where people spent more time together with out lots of pressure & enjoyed each others company. This area is a really unusual place, as it seems in the middle of nowhere now, but back in its heyday it was the hive of activity with the railway next door, the ferry at the end of the road ,the stock yards across the road, the forests full of trees for boat building & the prospecting of gold and gum . The garage is out of bounds at the moment. It's being fixed. This place had a great feel and the kids loved that old game of "connect four". They didn't miss the tv at all. Inviting traditional home in stunning area. Nick and I received a wonderful welcome from Andrea making us feel immediately at home. The cottage has everything you could want with an outdoor bath to die for, lovely way to end a busy day with a glass of wine stargazing! All store cupboard basics provided, and I had my first go with a popcorn machine...brilliant! We were told to help ourselves to the garden produce, delicious cucumber, courgettes and figs making our evening BBQ even better. Andrea is a delightful host and I could thoroughly recommend a stay. It was truly a pleasure to host you both, thank you for looking after the cottage beautifully. I am so pleased you got to relax and enjoy your stay. Blessings. I didn't stay at the property myself as I booked it for clients but Andrea was lovely to deal with during the booking process, would defintiely book with her again. Very spacious cottage. Beautiful surroundings and so convienently located. Great end to a great trip. Andrea was a great host and the local pub was brilliant. No one can help you enough!! We are in an area that is mostly dairy farming, a small community with lots to share about our rich History. You will need a vehicle or a bicycle to be able to see and do everything around this area. Bike the Hauraki Rail trail right next door,Motor Cross,4WD & Quad bike Dirt tracks in the hills,Walking tracks,Tramp,Hunt,Fish,Golf,Water sports,Beaches,Swimming all really close for you EXPLORE. Markets,Vintage,Local Boutique Cafes,Pubs, Restaurants,Breweries,Festivals,Museums,Art Studios,Gardens,Bird watching,Relax & unwind. Pururi Coach house along with the fresh spring water swimming holes. The beaches around us are at Waihi or drive the opposite direction to find an array of beaches a 20-45 min drive away dotted along the Thames Coromandel district.